Jun 11, 2003 in "Mission: SPACE"
"Kind of ironic I got my first ride on Mission:Space the same day NASA launched a rover to Mars. In a nutshell-- I have never smiled so huge, so long in my life! Literally, an ear-to-ear grin!!!!! !!! THE WORST SPOILERS YOU'VE EVER READ!!!!! I arrived at the park around 6:15pm and the M:S entrance was closed. CM's said it -may- or -may not- open tonight. About an hour later, the gates swung open. People who had been camping outside began filing in. Before you enter the building, there is a mock-up of the simulator capsule and CM's shouting out that "this is an intense ride." The queue line double-backs a few times outside (but covered) before heading inside the first of five "waiting rooms". 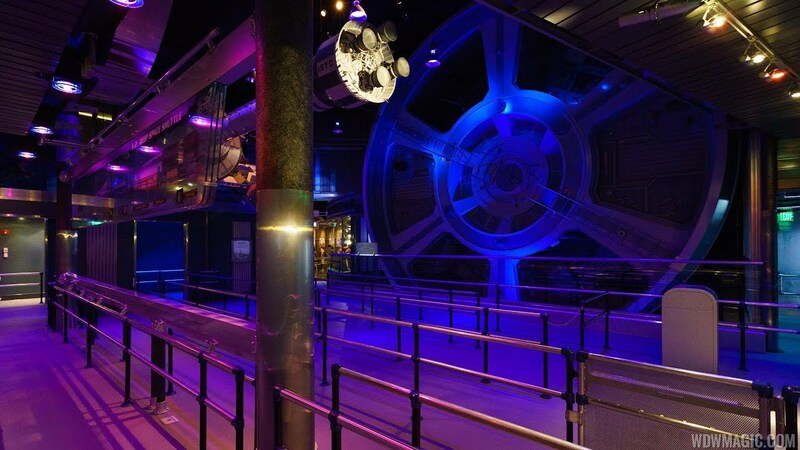 The first room is the one you've seen with the gravity wheel and suspended spacecraft. There are many queue switchbacks. The second room is a hallway with portraits of space pioneers (along with a few fictional future ones) Opposite the photos is "Mission Control", which resembles the old "Mission to Mars" preshow area except everything sparkles with light and color. Behind the props, real-life CM's can be seen controlling the attraction. Also, on many monitors is video footage of riders in their capsules (live or taped???) as well as computer animation of the centrifuge simulator. The next room is the "hub" containing four sliding doors (one in each corner, each eventually leading to the four centrifuges). Inside each door is a rectangular briefing room (the one with the video monitors and the space suits). Gary Sinise is perhaps the most perfectly cast actor in a Disney attraction. Unlike some of the other cheesy pre-show videos, this one is downright CLASSY. His calm, inspirational voice just helps build the excitement. Inside the briefing room, guests are put in groups of four, standing on one of 16 rows of dots. 8 of the rows proceed through the right door, the rest go through the left. Leaving the briefing room, guests enter a circular hallway that surrounds the centrifuges. A CM leads each group to a door around the circle. After another short video with Gary Sinise, the doors swing open. The capsules are the most detailed ride vehicle ever designed. As I'll explain later, there is a lot of waiting around for the ride to start, so the detail occupies your time. There are numerous fake buttons and switches you can play with. To clear up the speculation... THIS ATTRACTION IS NOT REALLY INTERACTIVE. Yes, you are instructed to push buttons when lighted. But the show doesn't change if you fail to act. The buttons and joysticks are the equivalent of the non-functional steering wheels on the old Mr. Toad cars. Only this time, they want you to pretend! As you've read elsewhere, liftoff is the most exhilarating experience at Disney. Words can't describe it. It is also the most realistic part of the ride. VERY real. After reaching outer space, you feel the rocket's second stage being jettisoned, and then you float out of your seat in zero-G. Again, words can't describe. The shuttle does a high-G spin around the moon, you shoot past earth, and then go into "hypersleep" (the cabin goes dark for a few seconds) You awake in an asteroid field just beyond Mars. After dodging the rocks, you enter the Martian atmosphere, and then fly horizontally through the desert canyons (picture zooming across the Death Star) You eventually attempt to land on an airstrip using the vibrating "manual pilot" joystick. The shuttle skids off the end of the runway and teeters on the edge of a deep, snowy canyon, when suddenly it rocks backwards to a safe landing. Once exited from the capsule, guests are ushered out a huge warehouse door into a hallway which leads to the post-show area. ** Motion sickness-- I don't do the Teacups. Even the carousel can make me uncomfortable. With Mission:Space, I DID NOT FEEL LIKE I WAS SPINNING. However, I did get a bit light-headed from the extreme G-forces. It was the IDENTICAL sensation I get while riding fast steel coasters like Kraken and Hulk--- possibly a result of the G-forces pressing on my chest and making it harder to breathe. For me, it was almost a welcome light-headedness--- making the experience even more surreal. ** Room for improvement--- Disney still needs to streamline the guest flow through the attraction Tonight, we spent a lot of time waiting in each "holding room", even after the video was done. But geez, this is only their SECOND day with real guests! That's WHY Disney is conducting these guest tests!!!!!!!! ** Overall--- I can't wait to go back and ride it again! There is just too much to take in. The visuals, the audio, the unique sensations on your body. I don't think I'll ever get as close to the sensation of real spaceflight like I did tonight." Mission: SPACE reopening moved back to October?